It’ll be a fun race report to write, but here’s a brief synopsis. went out in just under 1:30, came back a little over 1:27. Couldn’t be happier. My body hurts right now! Thanks for the tracking and encouragements!! Congratulations, Ace! That's breaking 3 in style. Has anyone seen this virtual NYC marathon nonsense? Pay to run 26.2 on your own for a guaranteed opportunity to pay again to pay for the real thing in 2019. But God forbid anyone from the area get in through the (paid?) lottery. Going to jog this ill advised half. Didn't completely make up my mind on that until I got up this morning. You told me so. Aced it big time! Huge PR and solid sub-3! Congrats! Congrats to Ace. Very impressive! I had a good day as well. Thanks to all advising to go for it. Perfect conditions and came in around 1:28. Timing was messed up so I don't have an official time or placement yet, but I did receive the special gift given to the top 50 (a blanket). Try for a brief report. Snow Canyon Half Marathon. Location, Southern Utah. Downhill course running through the state park and then a suburb of St. George. Listed as one of the most beautiful half marathons in the country. Usually about 2000 runners for the half and 5k. Goal for the race was to PR sub 1:38. Pre-race - some concern coming off of a big weekend before (70 miles hiking and jogging in 2 days) and travel time. Sluggish the first part of the week. Kept the mileage short and then did some strides at the end of the week. Started feeling better. Hay harvest left me with a sore back and diesel exhaust and hay dirt in my lungs. Nothing better than a run to flush that out. Some injury concern with a sore foot (stone bruise for months) and tight hamstrings. A little paranoid after reading some of the injuries in the 3:20 group. A good training month with a mileage PR (300+) but no speed work. Grabbed a coffee, a couple of mini muffins, and an apple at the continental breakfast. I brought a baggie of bacon from home. Ate some bacon pre bus ride, the apple on the bus, and bacon post bus ride. Still felt hungry so I had a gel pre race. Risky as I have not had a gel in months but I am known to have an iron gut. I was on one of the earlier buses and didn't want to stand around in the cold. About 40 with a wind. The staging area was at a trail head so I headed up the trail for a warm up. One mile up with rocky terrain about 300 gain. Watched the sky lighten and the race crowd below. Was really neat. Headed back down and chatted with a few familiar faces. Lined up about 10 rows back and the race started. Ditched the sweatshirt last minute at the donation bin. Popped a lifesaver in my mouth (lasted 6 miles). Mile 1 - pace ?, guessing around 7mm. A little slow out of the start and some weaving to get into position. Started behind the 1:40 pacer. Too slow and passed that group. Looked at my watch and the GPS didn't start. Started it at the first mile marker. A tail wind made it hard to control the pace. Mile 2 - 6:52 - course flattened and I tried to slow knowing I was going to fast. Figured about 100+ runners in front of me. Breathing was good. Surprised that those around me were already laboring. Mile 3 - 6:20 - hit the first steep downhill and opened it up and had beautiful view of Snow Canyon. Kept pace with some young bucks with good knees. Passing some others that were probably smarter than I. Mile 4 - 6:24 - course leveled again and made the turn into the state park. Mile 5 - 6:24 - steepest part of the course. Started to feel some knee ache and was concerned. Adjusted my stride to shorter steps. Mile 6 - 6:32 - caught the 1:30 pacer and thought it would be smart to stick around him. He was only pacing 2 runners. Mile 7 - 6:36 - all is good and enjoying the beauty of the park. Runners really spread out at this point. Mile 8 - 6:46 - course flattening out. Exiting the park. Dropped the 1:30 pacer. Got passed for the last time. Mile 9 - 6:46 - course is now on a rough bike path but any variety is welcomed. Passed the runner that passed me and now I am started to pass a lot of runners. Mile 10 - 6:52 - start feeling left ankle pain, right foot, stone bruise is hurting and a hot spot forming on the heel. Mile 11 - 7:14 - lots of ups and downs where the path intersects subdivision entrances. Slow a little because of a slight side stitch. The whole crowd is slowing and I pass several more runners. Thought about a drink but bypass the aid station because of the side stitch. Mile 12 - 7:02 - some short hills. Keep a good pace and pass more runners. Mile 13 - 7:04 - just hanging on, breathing hard now. Try for a finishing kick but don't have one. Finish - Wave to my brother. Cross the line with the clock showing 1:28 something. Possible a sub 1:28 with a chip time. Gave it all I had. Wouldn't have changed a thing. A good hard effort and really surprised myself. Gear - Shoes, NB 1500 fairly new, about 25 miles on them. Socks, BOA split shorts. Visor. Jersey gloves dropped at the first aid station. Nutrition, hydration - One peppermint lifesaver. No stops during the race. Nice job to both Ace and Beryl. Ace - what an excellent performance, both in time and in execution. Really really well done. And Beryl - good PR for you. How do you remember all that detail each mile? McBen - how did it go? Watched NYC today. Absolutely insane race by Keitany. Must have been the shoes. My week: 57 miles running plus 33 "miles" pool-running. W: 14 miles, including 8K tempo in 32:18 (6:40/6:29/6:27/6:24/6:18). Also did a 3 400s in around 93-94 to help a friend with her workout. Also injury prevention work and recovery swimming. Th: Yoga and 10 "miles" poolrunning; later another 4 "miles" pool-running. F: 12 miles very easy (9:04) also drills/strides and upper body strengthwork/core. Sa: 21 miles progressive, split as first 7 averaging 8:42, next 7 averaging 7:28, last 7 averaging 6:41 (majority of last 7 was downhill). Also light injury prevention work and recovery swimming. Beryl: Congrats on the huge PR and sub-1:30! Dwave: I agree on remembering details. I can't remember what happens in a 5K, let alone a HM or FM. LOL. They should've knocked a minute off her official finishing time for doing it without spring blades. Funny every single other podium finisher wore pink. I would definely question the strategy that let her basically walk the first half, although Vivian and Molly should have been more competitive in that style race, but Cheruiyot had the incredible London performance (5th fastest all-time) so maybe an off day wasn’t unexpected. Molly I can’t figure, she should be significantly better than shalane. Before today, only two men had ever broken 2:07 at the New York City Marathon. Today, Geoffrey Kamworor ran 2:06:26 and finished third. Beryl - Nice time on the half, and good RR. Nice weeks to DWave, OMR, and Rovatti. Didn't get to watch NY aside from following JMac, a local running buddy, and the woman who beat me in my last HM (ran 3:03:something). Wouldn't have missed DD1's first soccer tournament for anything! First week of the taper is done for me. Bleh. Low volume (relatively), easier workouts (shorter duration, not lesser intensity), and cool temps are leaving my HR really low for the paces I'm running. If I were to go "by the numbers" it would look like my fitness is taking a nosedive. Life got in the way a bit and I missed ~10 miles compared to what I planned, but I'm not concerned about it. I'll likely have a pretty tough workout hitting all the paces on Thursday as a final big stimulus, but other than that it's just by the book. Great performances for everyone racing this weekend. Ace great job on sub 3. Beryl way to go with sub 1:30. I haven't even dipped below that mark yet. I'm currently looking for a marathon to run in April - June on the West Coast with the first weekend in May blocked out. Part of me leans towards Revel because it's downhill, family lives there and it's a day drive however I have ZERO experience running an all downhill marathon and the longest downhill run I can think of training on is only 8 miles. Oakland seems early (March 24) but I could drive there. DW wants to tackle the backyard this summer as well as (my words not hers) not deal with marathon training runs on the weekend when we could be doing anything else like camp/hike/travel/play. What kind of training am I looking at for a 24 mile downhill run? The thing with Keitany is - who is going to be the sacrificial lamb to go out the first half to try to burn her out. If Keitany was having a good day (as she did yesterday) I think the only athlete who was realistically competitive with her was Cheruiyot - it would have been competitive suicide for any one else to try that stunt. 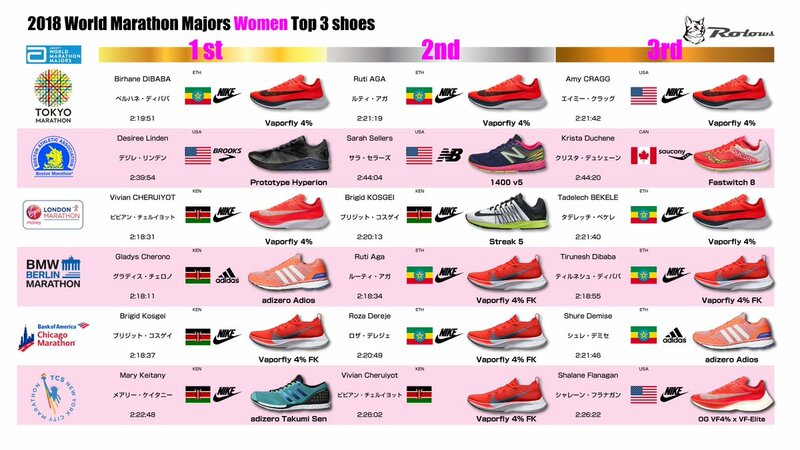 Interesting links to the shoes worn by the podium finishers at all the WMM. Lotsa VFs out there of various types. 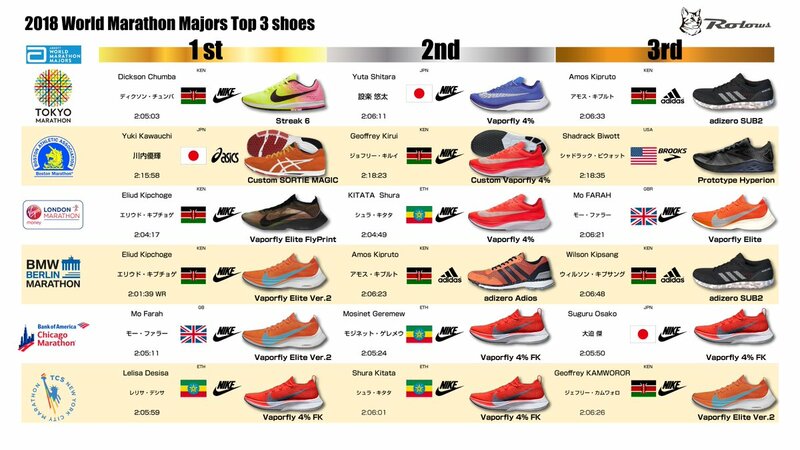 Two things that jump out are a) Kipchoge wore one type of VF for London, and then another for Berlin; b) there are Nike athletes besides Bernard Lagat who prefer to run in something other than the Vaporfly. Adios athletes seem divided between the Takumi Sen, the Adios, and the Sub-2. I'm not surprised at all that Shalane beat Molly - I think Molly is a rising superstar in the marathon, but Shalane has experience and training cycles focused on that distance that Molly does not. Also, while your first half of Chicago is a very good measure of your fitness during the first week of October, I'm guessing it's not that accurate as a measure of your current fitness as of this moment . Unless you bounce back much faster than I do, which is possible. Upper body weights and core, DIY yoga, and 8 miles very easy (8:45). Did some drills but no strides - it was one of those cold rainy mornings where I was chilled by the end, and I thought a hot shower would be more beneficial than strides.